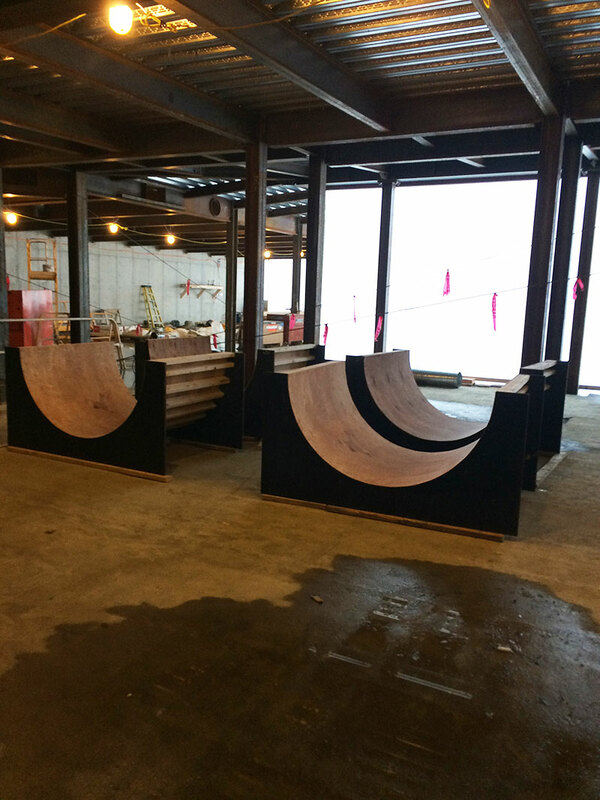 Steady progress has been made on the Neilson project over the winter recess. Favorable weather throughout most of December and early January has provided the opportunity to make up on some of the time lost due to the extraordinarily wet fall. 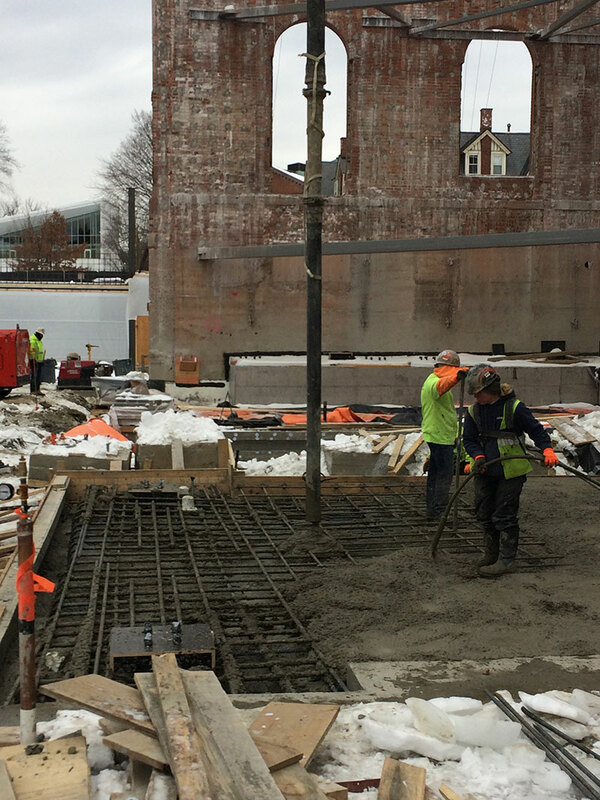 Since the last update on December 14, 2018, the contractor has completed several of the large concrete mat slab pours in the core 1909 building and they are very close to having a contiguous lower level mat slab from the north addition to the south addition. With the final pours over the next month, they'll be ready to start accepting the structural steel at the site and mobilize the crane to begin erecting the structural steel. Steel erection will start in a big way around the end of March. Placing a section of concrete mat slab in the core of 1909. The worker is vibrating the concrete to eliminate air pockets and to allow the concrete to flow freely into the forms. These circular forms (4 total) will be installed on the roof of the underground building to create natural light shafts from above into stack and study space below. This photo shows a steel girder in the background that is carried on two mini piles to temporarily support the end of the 1909 west pavilion wall. 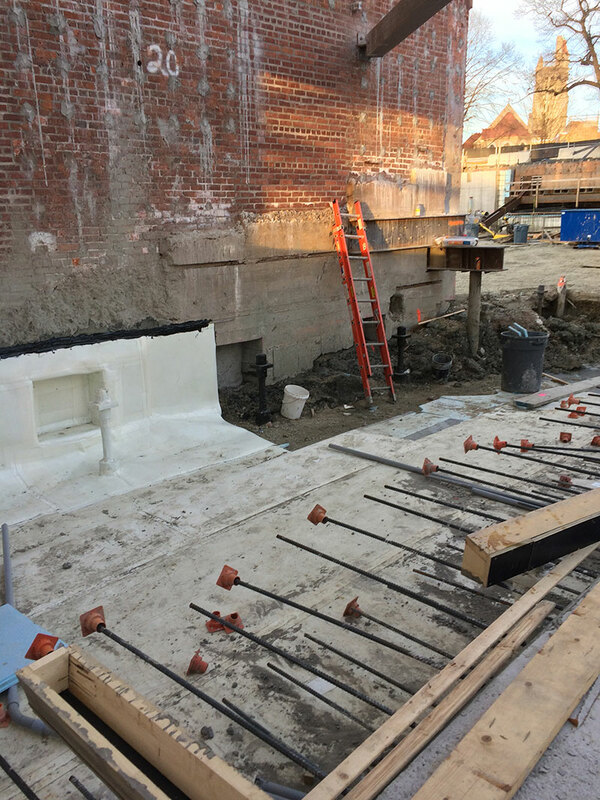 This temporary shoring is an example of the enabling work required to allow for the placement of new load bearing footings and slabs at the existing structure. In the foreground, the white waterproofing membrane sits on top of a mud slab and is wrapped up the interior face of the 1909 masonry wall. 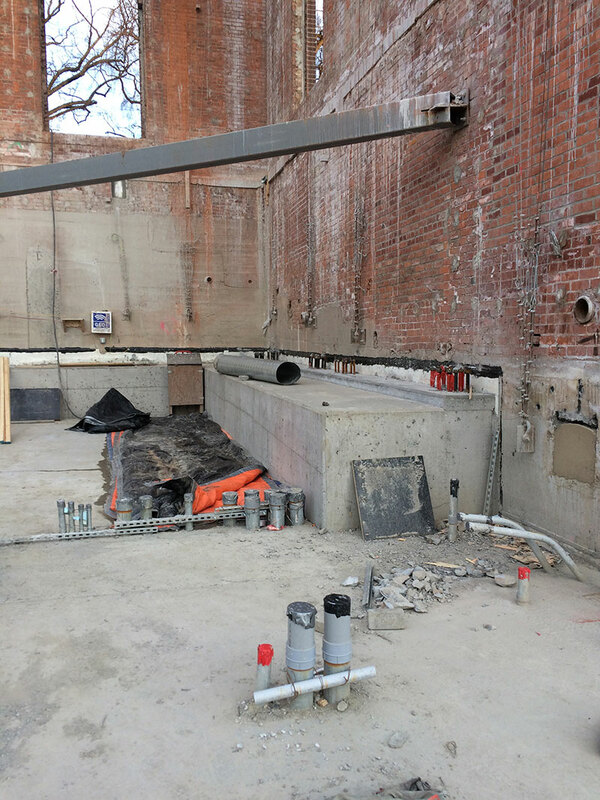 The rectangular indent into the vertical wall is where the steel reinforce concrete engages and transfers the vertical building load from the 1909 walls into the new mat slabs and mini piles in the core. This photo on the east 1909 pavilion shows a completed raised concrete haunch and mat slab. This new structure engages the east pavilion wall vertical loads and transfer them into new structure. 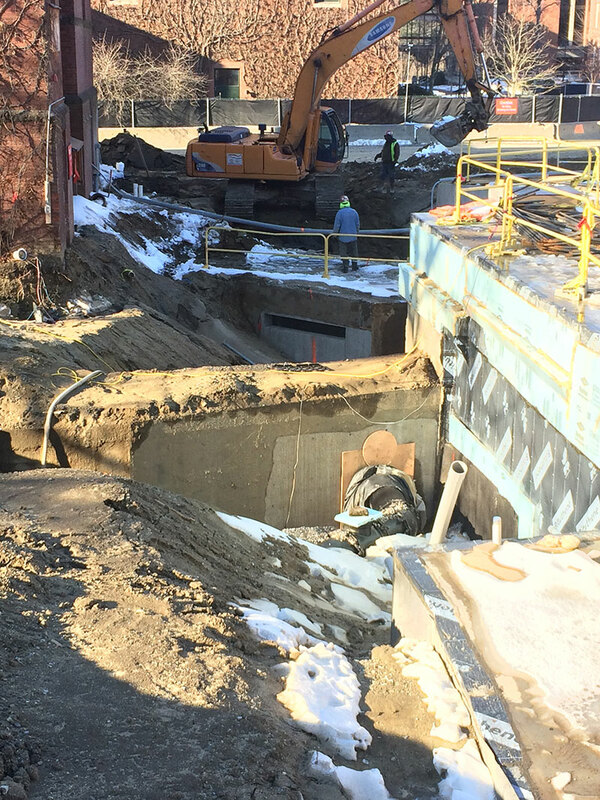 Although the Alumnae Gymnasium portion of the project is still months away from starting, the work to route utilities between Neilson and Alumnae Gym and the construction of the underground pedestrian connector is underway. This photo shows the Neilson south addition to the right and Alumnae Gym on the left. In the foreground is the 1945 steam tunnel entering the south sub-basement, behind it is the 1982 utility tunnel connecting Neilson sub-basement and Alumnae Gym. Between the two, the new pedestrian tunnel will be formed, installed and back filled by the end of February. Note the new 18" storm drain threading its way through the structures. It will run under the new pedestrian connector. 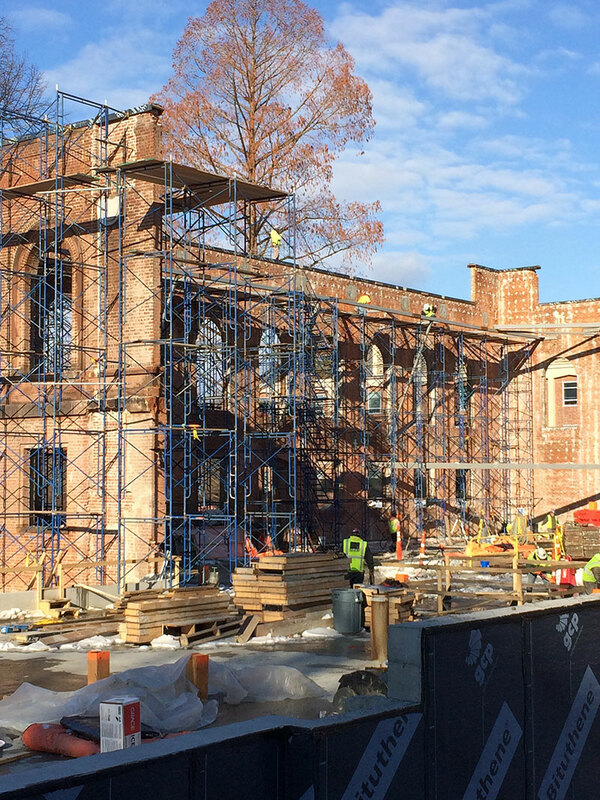 Staging is nearly complete on both sides of the west 1909 west pavilion to allow the masonry contractor to start installing new brick walls to replace those lost in the March 2018 cornice collapse. All but the face brick will be placed under heated tents high on the staging to allow the structural steel to be installed later this spring. The finish exterior brick and brownstone cornice will be placed in late summer after the steel structure is in place and when conditions are more favorable for installing finish masonry. West Pavilion staging in process. The construction crews have been alerted that classes are back in session and are aware of the increased activity on campus. As always, please use and encourage others to use caution around the construction entrances and please feel free to be in touch if you have any questions or concerns.